Yesterday we spent the day at the park. 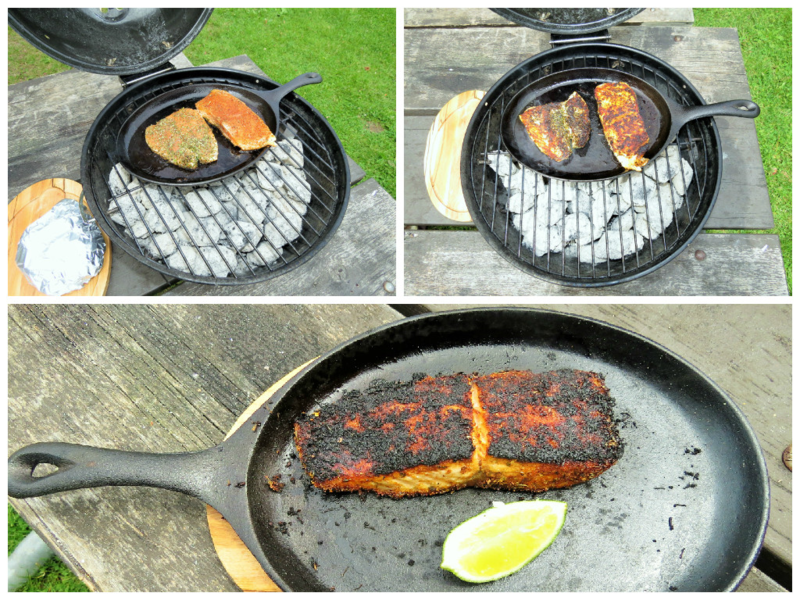 It was the perfect opportunity to grill some fresh salmon on the portable grill and try out the blackening seasoning I had made the week prior. I bought a large salmon removed the skin and filleted it. On the morning of our trip to the park, I coated the fillets in the blackening spice mix then placed them into a container and into the cooler. I also packed my fajita pan (cast-iron), an oven mitt, butter, and lime wedges. Traditionally blackened fish is cooked on a cast-iron pan because cast-iron has the ability to heat up very quickly to high temperatures, allowing the fish to blacken considerably. My husband ended up cooking some of the fillets on the cast iron pan placed atop of the grilling plate, and the rest of the fillets on the grill plate itself. The salmon cooked on the cast iron pan with a dab of butter was deeper in colour and had a very crispy outer layer in comparison to the grilled salmon fillets. Since this was our first time making blackened salmon, we ending up burning the outside a little, but thankfully not so much that it was inedible. 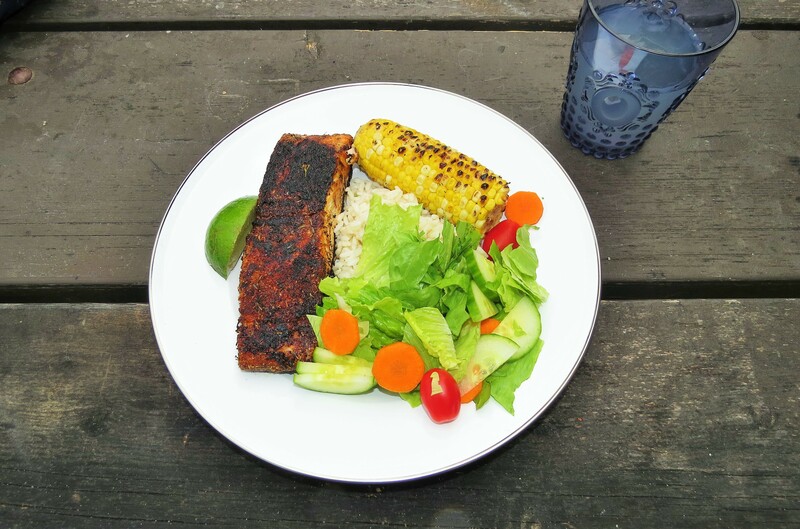 The salmon was served with lime wedges, a simple garden salad, corn on the cob, and basmati rice with peas. 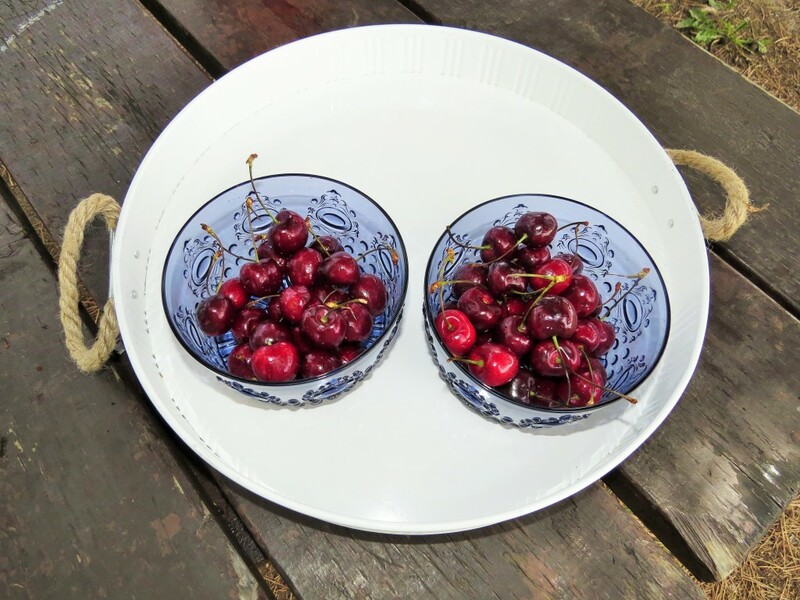 We had lemonade to drink and fresh cherries for dessert as well. Below is my blackening spice mix recipe. I add less thyme because I find thyme can be overpowering. The great thing is you can always add or lessen the amount of spices according to your personal preference. 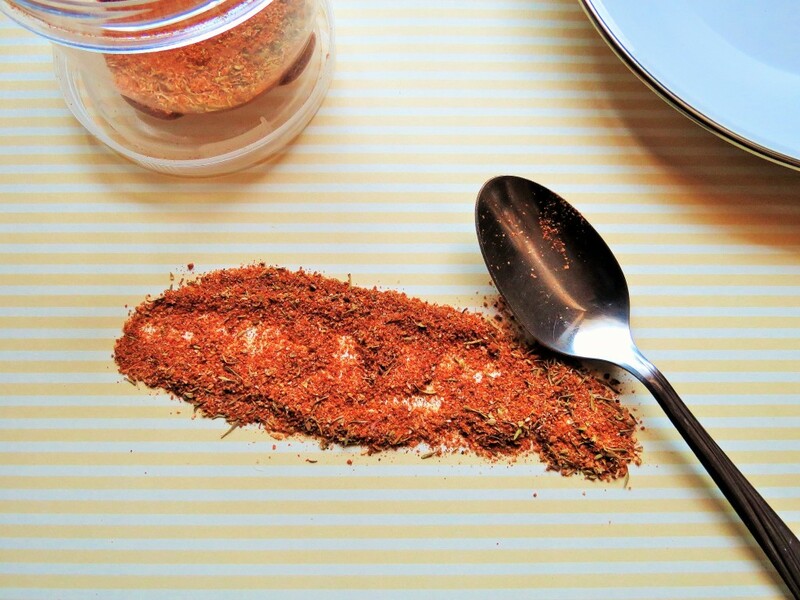 If buying blackening spice, look for good quality ones that are not too high in salt. Mix all ingredients together and store in an air-tight container until ready to use. To use, season your fish or meat with the amount desired. Rub a generous amount for the best flavour. It is best to cook blackened anything outdoors. The blackening process generates a lot of smoke and so good air circulation is mandatory. Blackening seasoning is great on seafood (salmon, halibut, tilapia, and shrimp) as well as chicken. For a variation make a half and half mixture of blackening spice and all-purpose flour. Sprinkle salt and lime juice on fish and the coat the fish in the flour mixture. Pan fry on a hot pan with a little bit of olive oil. Cast-iron pans rust very easily. DO NOT wash your cast-iron with soap because it will strip the oil that prevents rust. After cooking immerse the pan in hot water and scrub with a non-abrasive brush. Dry and then cover with a light coating of oil.